San Francisco Bay Area risk consultant Gil Oliva is willing to risk that his Samsung Galaxy Note 7 smartphone might catch fire, shrugging off a global recall that has damaged the South Korean manufacturer’s reputation and raised questions about its future. The stylish Galaxy Note 7, which boasts a curved screen, an iris scanner and a pen accessory, was well-regarded until some began catching fire. Oliva likened it to Ferrari sports cars, which also were recalled over fire issues in 2010. “I’ve got the Ferrari. And yes, Ferraris catch on fire sometimes,” said Oliva, 32, of Oakland, California. The 5.7-inch Galaxy Note 7 had been expected to accelerate Samsung’s mobile-sales momentum. Then, Samsung announced a global recall of 2.5 million Galaxy Note 7s in early September. The company said this week it would permanently stop production and sales. It urged users to power down and offered to exchange devices for other models globally. As the company works to contain damage and stop the recall from tainting the entire brand, some fans say they are not worried. The large-screen, $882 phone employs a similar design to Samsung’s flagship Galaxy S7, the best-selling Android phone in the first half of 2016. Samsung had hoped the Galaxy Note 7 would enjoy a similar appeal. Wall Street expects iPhone maker Apple to benefit from Samsung’s recall, along with makers of other phones running Android. Still, Verizon Communications spokeswoman Kelly Crummey said many Galaxy Note 7 customers are exchanging the recalled devices for other Samsung phones. Josh Dickey, entertainment editor at technology news site Mashable, said in an op-ed on Wednesday he would keep his phone, calculating a human was twice as likely to be struck by lightning as a Galaxy Note 7 was to catch fire. Fewer than 100 burning phones have been reported. Many other customers around the world had the same reaction. 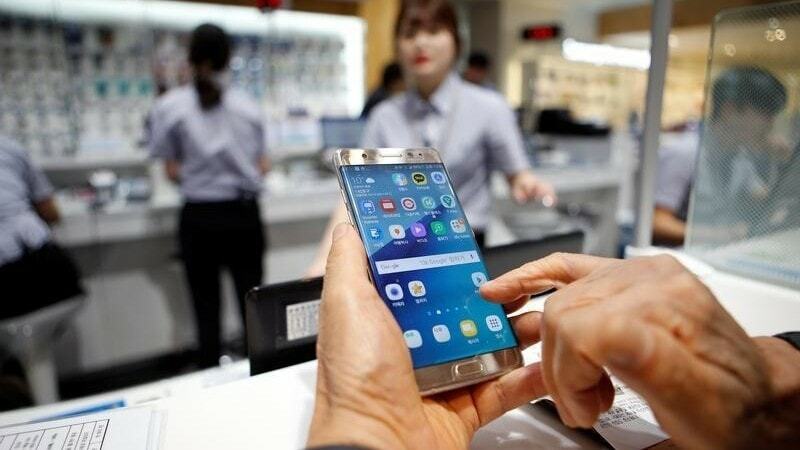 “The problem is there is no other phone that I like,” said Jo Hyang-won, a 32-year-old office worker in South Korea. Samsung expects the Galaxy Note 7 failure to dent profits by about $5.3 billion. It blamed faulty batteries for the original problem but has not guessed at what caused replacement phones to overheat. Sidrah Ahmad in Singapore said safety considerations mean eventually giving up the Note 7.